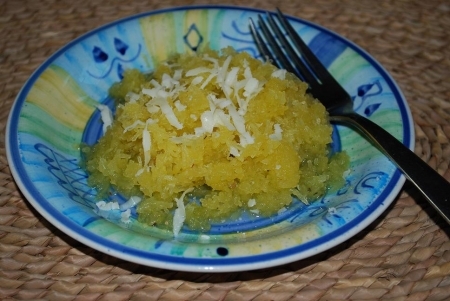 The flesh of the spaghetti squash has a mild flavor with small to long strands of flesh. Hence its name, spaghetti, making it perfect or creating Italian style dishes. This one focuses on the traditional buttered noodles take with extra flavor by adding Italian spices. Be careful when cutting the squash because they are very dense. Serves 4. Cut squash in half horizontally or vertically depending on the size of your squash and remove seeds and pulp. Place squash flesh side down in a roasting pan or cake pan and add enough water that a quarter of the squash is covered. Cover with foil and bake in a preheated oven at 375 degrees for about 1 hour and 15 minutes or until tender. Remove squash and scoop out flesh into a medium bowl. Be careful when removing foil, the steam is hot. Add butter, Italian seasoning, garlic powder, stir and taste. Add salt and pepper if needed and stir. Serve individually shown or family style with fresh grated parmesan cheese.